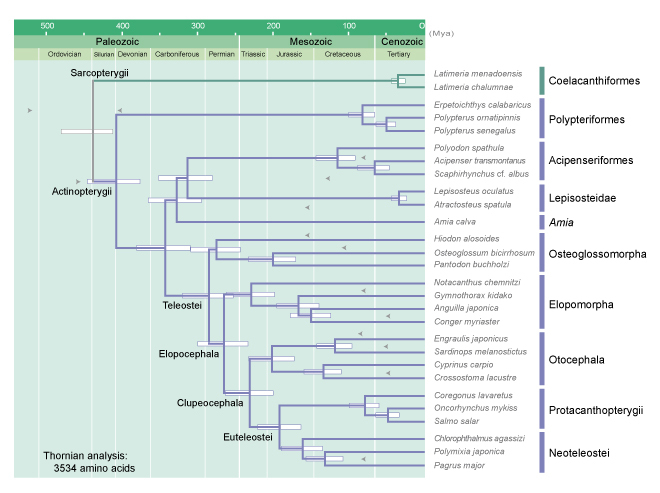 The correct interpretation of comparative genomic data among different organisms requires an evolutionary framework, namely, well-supported phylogeny with precise divergence times. The ray-finned fish, Actinopterygii, is the most diversified group of vertebrates, with over 28,000 species currently recognized. 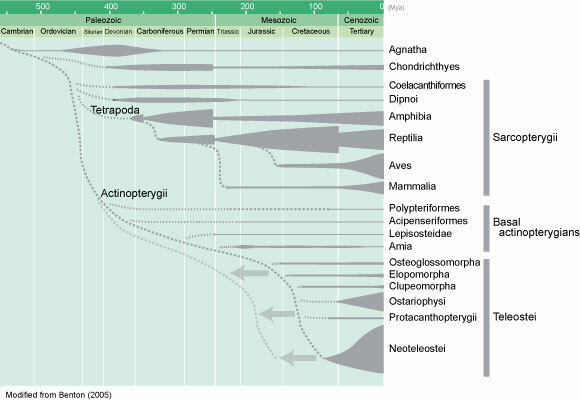 In comparison with other vertebrate groups, the interrelationships among major actinopterygian lineages remained ill defined. 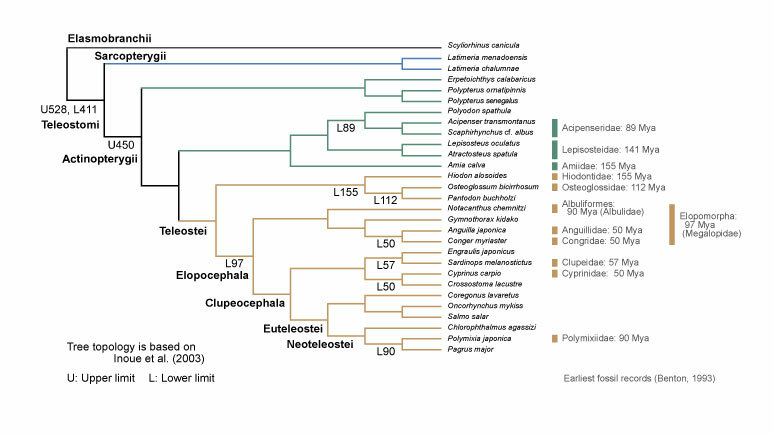 Molecular data on relationships of the major actinopterygian groups was limited until a flurry of publications appeared in 2003. Mitochondrial genome data have been accumulated based on the extensive taxonomic coverage of the actinopterygian diversity and demonstrated in recent studies as being useful for resolving higher-level relationships of actinopterygians (Inoue et al. 2003; Ishiguro et al. 2003; Miya et al. 2003; Saitoh et al. 2003). There remains controversy over the divergence times of actinopterygians. Paleontological records suggest that actinopterygians originated in the Late Ordovician and many of teleostean orders rapidly radiated in the Cretaceous or later. Recent molecular studies (e.g., Kumazawa et al. 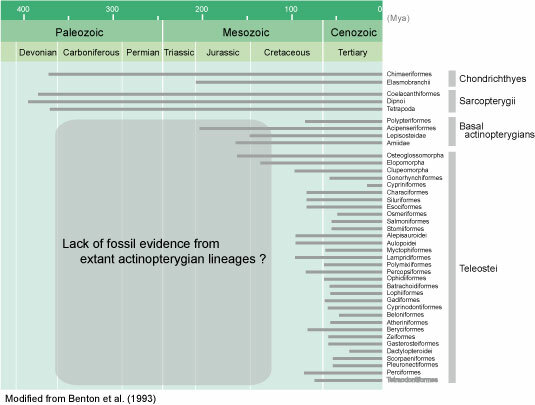 1999), however, suggested that the divergence times of actinopterygian lineages were about twice as old as those deduced from fossil records. They interpret this apparent discrepancy to be indicative of paucity of teleostean fossil records. In fact, fossils of fishes are not necessarily considered well preserved in general. 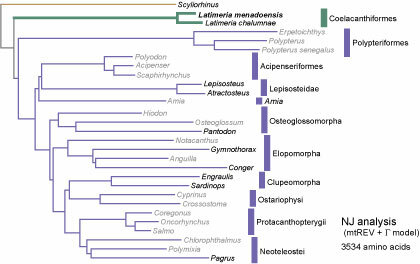 The purpose of the present study was to estimate the divergence times of basal actinopterygian lineages using long DNA sequences with extensive taxonomic sampling. The previous molecular studies failed to estimate divergence times among all the major lineages because of short DNA sequences and evolutionary rate heterogeneity among the species. In addition to the traditional molecular clock analysis, we employed the partitioned Bayesian approach, which does not assume constancy of evolutionary rates (Thorne and Kishino 2002). The two-cluster test showed that the substitution rates for the 18 actinopterygian lineages (gray) are significantly different from the two coelacanths. Using the divergence time between sarcopterygians and actinopterygians (450 Mya) as the calibration point, we estimated divergence time among the major lineages based on mtREV + G model (see above). Our estimates agree with previous molecular studies. However the values were one and half times older than those deduced from fossil records. Especially, estimated times within Teleostei were much older than fossil based values. Thus, there appears to be a time gap between the molecular and fossil evidence. Molecular data suggests paucity of teleostean fossil records again. 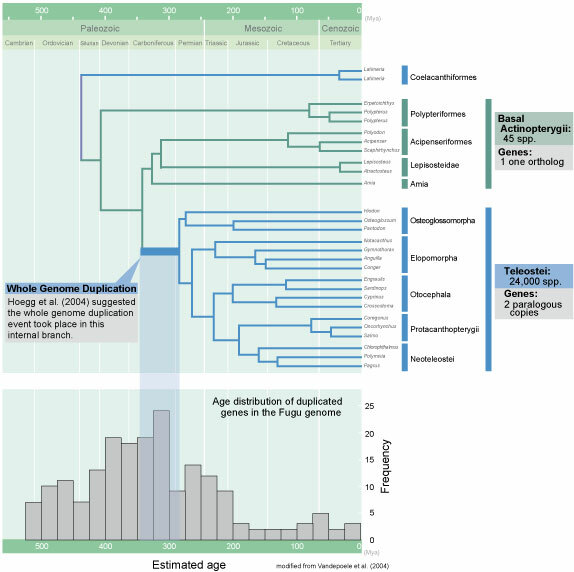 Recent molecular studies suggested that the genome duplication event took place after the split of the basal actinopterygians from the stem lineage but before the divergence of Osteoglossiformes based on the analysis of three nuclear genes (Hoegg et al. 2004) and Hox genes (Crow et al. 2006) from some teleosts and basal actinopterygians. According to our results, the whole-genome duplication event took place 360-310 Mya. 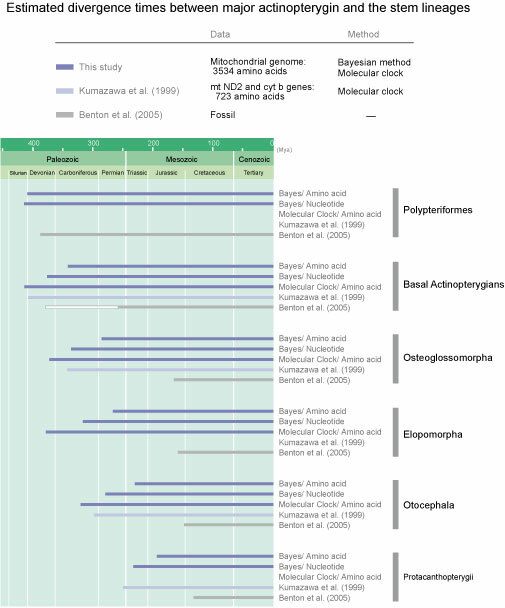 The estimated age of duplicated genes in Fugu genome agreed with our mitogenome estimation. Christoffels et al. (2004) and Vandepoele et al. (2004) estimated the age of Fugu duplicate genes and paralogous chromosomal regions between Fugu and humans using the molecular clock. Their analysis consistently showed that an increased amount of duplicated genes originated around 350-320 Mya. Teleostei is the most diversified group of vertebrates, with over 24,000 species. On the contrary, four basal actinopterygians comprises only 45 species. Was the whole genome duplication responsible for the dramatic rise of the teleosts? Future comparative, phylogenomic, and functional genomic analyses of fish genomes will shed additional light on this question. Christoffels A, Koh EGL, Chia JM, et al. Crow KD, Stadler PF, Lynch VJ, et al. Hoegg S, Brinkmann H, Taylor JS, et al. Inoue, J. G., Miya, M., Venkatesh, B., Nishida, M. 2005. The mitochondrial genome of Indonesian coelacanth Latimeria menadoensis (Sarcopterygii: Coelacanthiformes) and divergence time estimation between the two coelacanths. Kumazawa, Y., M. Yamaguchi, and M. Nishida. 1999. Mitochondrial molecular clocks and the origin of euteleostean biodiversity: familial radiation of perciforms may have predated the Cretaceous/Tertiary boundary. Pages 35-52 in The Biology of Biodiversity (M. Kato, ed.) Springer-Verlag, Tokyo. Vandepoele K, De Vos W, Taylor JS, et al.